MikroTik RouterBOARD 11E miniPCI Express to PCI Express adapter is an adapter for 3.3v miniPCI Express to PCI Express standard sockets. 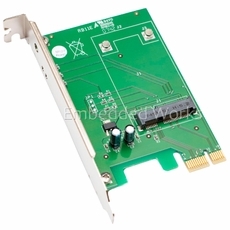 NOTE: That only wireless 802.11a/b/g/n cards are supported in this adapter. It will not work with 3G mini cards due to USB connectivity incompatibility.